Filed in the United States District Court for the Eastern District of Texas, Marshall Division on Thursday, Rembrandt has accused Apple of infringing on two patents, both of which are associated with the underlying technology used for Bluetooth. 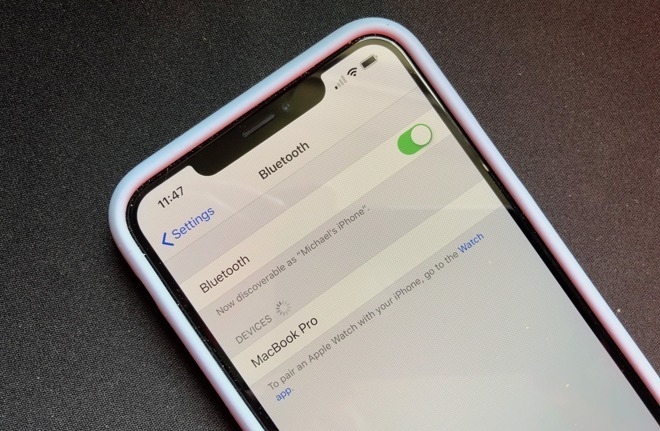 The complaint claims all products produced by Apple that supports Bluetooth 2.0 or later and Enhanced Data Rate (EDR) are targets for the lawsuit, including almost all iPhone models, iPad Pro, iPads, Macs, HomePod, and items under the Beats brand. The patents in question are numbers 8,023,580 and 8,457,228, both titled "System and method of communication using at least two modulation methods," effectively how communications between two devices can be performed using two or more different modulation methods, potentially improving the speed of communication. According to the suit, Apple's products have two different modulations at play when using Bluetooth EDR, with a first Gaussian Frequency Shift Keying (GFSK) accompanied by Differential Phase Shift Keying (DPSK), satisfying the two method element of the '228 patent. Apple is also said to have encouraged its direct and indirect customers to use products interoperable with Bluetooth EDR specifications, which the firm also claims to be an infringement of the same patent. As the '580 patent covers a lot of the same ground for Bluetooth EDR, the encouragement of using the technology again is said to be an infringement. Unusually, the patents being sued over both expired on December 4, 2018, but the company claims this does not matter as it is "entitled to damages for infringement that occurred prior to the expiration." The suit highlights the success of Rembrandt in protecting its patents, noting litigation against both Samsung and Blackberry, with both firms ultimately licensing the patents. In the case of Samsung, a jury found in favor of Rembrandt and awarded past-damages of $15.7 million. On appeal, the figure was reduced down to $11.1 million following a recalculation. In the case against Apple, Rembrandt demands a trial by jury, a declaration of willful infringement, damages, attorney's fees, and "further relief as the Court may deem just and proper." This is not the first time Apple has dealt with Rembrandt. In 2014, a patent infringement lawsuit was launch concerning the secure booting and recovery of electronic devices. "Rembrandt is committed to helping patent owners obtain fair value for their inventions," said Dr. Paul Schneck, Rembrandt's Chairman at the time of the 2014 legal action. "Without companies like ours, many inventors would be without recourse when large companies have taken their inventions without permission and they need to litigate to enforce their rights. Rembrandt provides the necessary expertise and capital to level the playing field between inventors and well-funded infringers." Samsung only paid $11 million in a similar suit? Apple should probably just buy the patent. If it only cost Samsung $11M for all their phones then it must not be a relevant part of the actual Bluetooth specification, which I assume is standards based. How many hundreds of companies use bluetooth in their devices and only Apple and Samsung get sued for a now expired patent, it should be obvious to the blind that these people are trying to get a payday off of someone else's work. Whats the point of buying an expired patent? And if there was any point on buying it, do you think the patent troll will sell it? Apple should first ask for a change in venue. SCOTUS ruled a year or two ago that companies can't simply choose a jurisdiction that's favorable to them when they file a suit against another entity. They have to file in the jurisdiction in which they're incorporated. Rembrandt is incorporated in PA, so the case should be moved there. what’s the deal with East Texas Courts and patents? That's not what that case decided. It was a case involving a small company with no corporate presence in Texas. Apple has a presence in Texas, so it can't get relief based on that rationale. This particular court is known for speed, and for favoring the complainant. I don't believe you are correct, it's not limited to where the companies are incorporated. IIRC rather than venue shopping lawsuits can only be filed against a company in a state where they do business. Since Apple has several corporate operations located within Texas that should qualify.